The classic television series is turned into a taut big screen thriller. 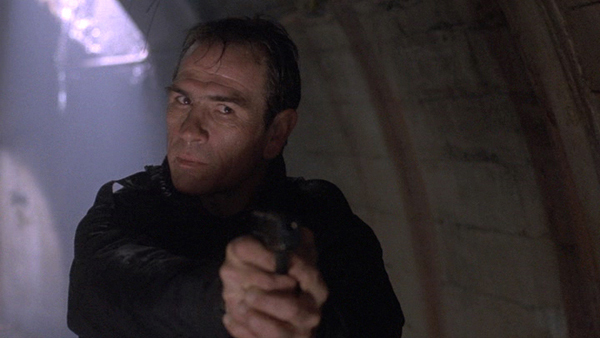 The Fugitive is the story of a doctor wrongly accused of murdering his wife, and the movie is injected with a large dose of sweet adrenaline thanks to Tommy Lee Jones' legendary portrayal of the relentless US Marshal Gerard. Doctor Richard Kimble (Harrison Ford) arrives at his Chicago home to find an intruder with a prosthetic arm killing his alluring wife (Sela Ward). In the tussle that follows, the killer escapes, and Kimble is convicted of murder and sentenced to death. In a stroke of fortune, the bus transporting him to the federal prison facility is involved in a botched escape attempt instigated by other inmates, causing a horrific crash. Kimble finds himself miraculously free and on the run in the wilderness. Uncompromising Federal Marshal Samuel Gerard (Jones) and his team coordinate the manhunt for Kimble, now considered an escaped felon. Kimble is barely able to stay one step ahead of Gerard, but in a brief encounter he insists that he is innocent of killing his wife. Hotly pursued, Kimble takes a risk by returning to Chicago. He seeks the help of former colleagues including Doctor Charles Nichols (Jeroen Krabbe), and then takes it upon himself to investigate hospital records to identify the man with the prosthetic arm. He also finds time to save the life of a patient under the care of Doctor Anne Eastman (Julianne Moore). As Gerard closes in on him, Kimble uncovers the conspiracy behind his wife's murder, and Gerard has to confront the new reality that the man he has been chasing may have been wrongly convicted. The Fugitive is not perfect. The plot involving the falsification of test results for a new drug to benefit greedy pharmaceutical corporations and their sleazy doctor friends is half-baked, and the resultant attempt at explaining the connivance behind Helen Kimble's murder is a rushed mishmash of confusion. But in The Fugitive, the evil behind the murder is very much a secondary concern, well behind the thrill of the chase and the battle of wits behind two equally determined men. And director Andrew Davis nails all the elements related to the central chess game between Kimble and Gerard. Kimble is a bewildered victim pushed to the limit by events greater than himself, but always retaining his humanity as he embarks on a mighty struggle to prove his innocence. It is one of Ford's better career roles, combining desperate thinking on the fly with interludes of well-oiled tension and sprinkles of unconstrained action. As good as Harrison is, Jones runs away with the movie. The Jeb Stuart and David Twohy screenplay insists on making The Fugitive a chase propelled by two engines, and they build-up Gerard's personality into a cool, aggressive, and deadly law man, ferocious in the chase, attentive to details, a hard task master, three steps ahead of his team, eloquently egotistical, and quick with the witty remark. Jones deservedly won the Best Supporting Actor Academy Award, and the role helped to revitalize his movie career. Sela Ward does not get much to do. She is mostly seen in flashbacks and then in various reinterpretations of Helen Kimble's death scene. Julianne Moore inexplicably receives a high billing but has less than five minutes of screen time as a harried doctor who encounters Kimble as he snoops around the hospital. But when action is needed, Davis delivers, starting with a most impressive bus/train crash sequence, full of squealing, trundling metal and featuring the narrowest of escapes, giving Kimble his shot of freedom at the expense of having to deal with Gerard. 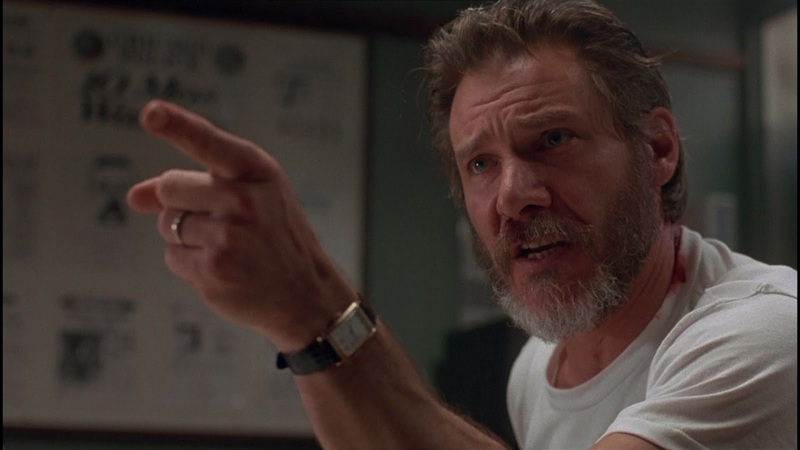 In The Fugitive not only is the chase better than the catch, the hunter and the prey are equally captivating.